"Makes a great gift for a young one who’s ready to flex her creative muscles." "A great rainy-day activity or gift to spark a child’s creativity." "Gives toddlers plenty of materials to explore while minimizing the risks." "Provides lots of ways to learn and explore shapes, practice letters and explore patterns." "Encourages creativity and allows children to experiment with how different media create color." "A must for tweens who want to craft with friends and make things they can use and show off." "A sophisticated kit with just a touch of whimsy." "A surefire hit as a gift or a surprise activity." "As soothing for kids as it is for experienced adults." 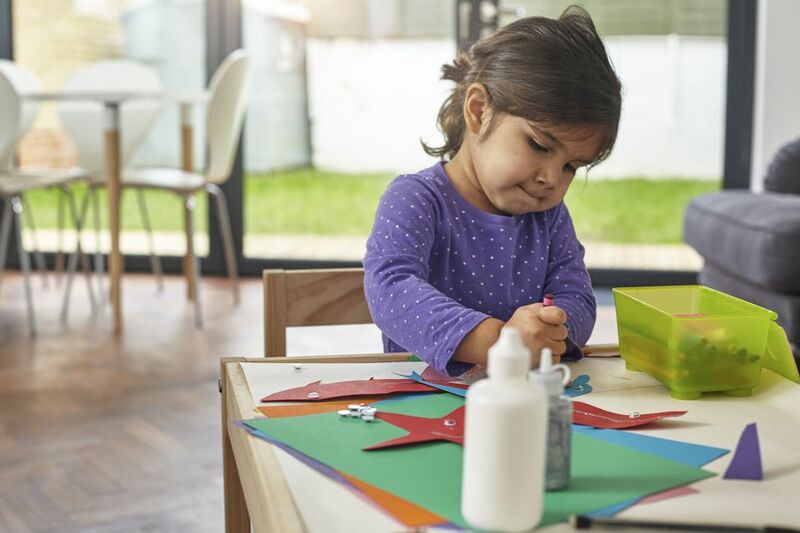 For kids, arts and crafts are all about thinking creatively and exploring color and texture, all while fine-tuning motor skills. As proud as children are of their final product, young ones will also enjoy the process of creating art: the feel of fuzzy or prickly chenille stems between their fingers, the snip when they cut through different materials and the pleasure dipping their hands into a tub of colorful pompoms, sequins or beads to pick the just-right one for the current project. For maximum creativity, look for a kit with a variety of kid-friendly materials and no rules, like this kit one for kids ages 3 and up, which includes everything from beads to felt to chenille stems and kid-safe scissors. 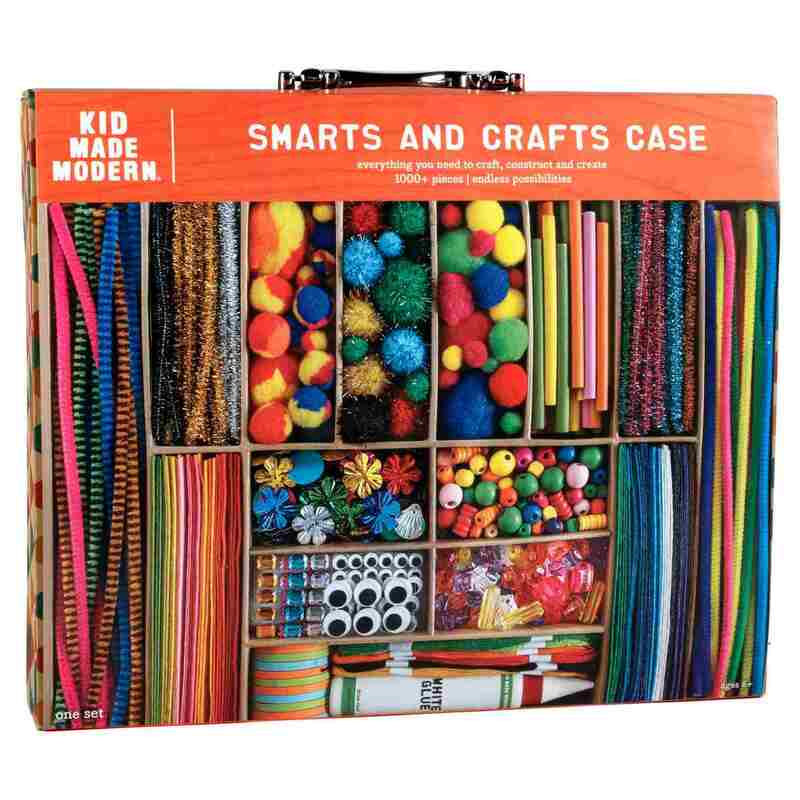 This kit makes a great gift for a young one who’s ready to flex her creative muscles! Kids love quirky items they can make to keep or give as gifts, and this pet rock turtle is a silly addition to a bedroom, garden or family room. The kit (recommended for kids 8 and older) comes with a turtle-shaped rock, paints and a paintbrush to personalize it however they want — pretty, silly, even Ninja-style! It’s a great rainy-day activity or gift to spark a child’s creativity. Is your toddler ready to make some art? Then this craft kit is a great fit. With the youngest children, the key is to give them plenty of materials to explore, while minimizing the risks that can come with hard-to-manipulate tools and small materials that can become choking hazards. That’s why this kit is a favorite: It includes easy-grip crayons, paper in different textures (crinkly, tissue and fringe), doilies, stickers and activity papers to spark your child’s imagination. With a grownup helper, children ages 18 months and up can safely make art that they’ll be proud of. Kids start exploring paint with their fingers, but once they’re a little more sophisticated, they love using tools to manipulate the color. This kit provides lots of way to learn and explore shapes, practice letters, and explore patterns. Kids will love interacting with their favorite paint (not included) in a new way by rolling on designs, stamping patterns and letters and brushing it on with tools of different sizes and shapes. Once your child has mastered the basic coloring and painting skills, it’s fun for them to explore different ways to play with color using different materials — and a kit that’s jam-packed with markers, crayons, oil pastels, colored pencils and more will certainly wow them! This one comes in its own carrying case for easy storage between uses or to bring on a road trip, to grandma’s house or just outside to work on a drawing on a beautiful day. This popular art kit encourages creativity and allows children to experiment with how different media create color. If your kid hasn’t hit their rainbow loom phase, it’s only a matter of time! This crafting phenomenon is just as popular with boys as girls and is used to create dimensional art, from accessories and backpack charms to artwork and toys using tiny colored rubber bands. This kit includes more than 600 colored bands and 24 clips to spark their creative juices. Plus, you can purchase extra accessories like stickers and clips to further personalize their art. Overall, it’s a must for a tween (ages 10-13) who wants to craft with friends and make things they can use and show off. By the time kids are in high school (this kit is for ages 12-plus), they’re looking for ways to express their creativity without seeming too childish. This terrarium is a sophisticated kit with just a touch of whimsy, so it’s not too grownup for a parent to approve of. The terrarium mixes activities like gardening, sand art and decorating to create a beautiful space to grow plants within your child's own room. The trendy design will make them feel cool among their peers, too. Origami, the ancient Japanese art of folding paper, is as soothing for kids as it is for experienced adults. Better for older kids who can fold with precision or younger ones who can work with an adult, origami is not only a fun way to manipulate paper and see what you can create, but also a good way to challenge spatial thinking and teach patience. Beyond colorful papers in kid-friendly patterns, this kits includes add-ons like sticker animal features and string to take their folded creations to the next level.